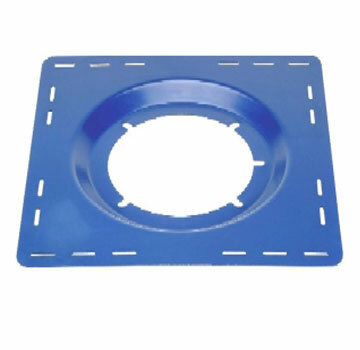 PRODUCT: ZURN #66372 TOP SET DECK PLATE FOR Z100 15" DRAIN. FEATURES: The Zurn TOP-SET® Roof Drain Deck Plate (catalog option -DP) features ease of installation, allowing the installer to move onto more projects sooner. The TOP-SET® Deck Plate allows for the entire roof drain assembly to be installed from the topside of the roof. Separate underdeck clamps and roof-sump receivers are no longer necessary … the deck plate acts as both. Only the pipe connection is completed from the underside of the roof. OPTIONS: Zurn manufactures three different size (-DP) deck plates for a trouble-free fit for all main roof drain sizes - Z100 (15˝), Z121(12˝), Z125 (8˝)[8", 12" and 15"] Zurn drains. Constructed of 14-gauge steel with a corrosive resistant finish. Includes strategically placed slots allowing versatile securing arrangements to various roof decks. Fast – Contractor can install roof drain in half the time as conventional methods … a superior method of installation using a bolt down system that secures roof drain assembly integrally to roof deck. Secure – Unique design combines traditional roof sump receiver with deck clamp to provide a more secure, long lasting installation of the roof drain. Safe – Contractor can install roof drain from top of roof eliminating costly and dangerous assembly of components from the underside of the the roof deck, leaving the pipe connection as the only remaining task from under the roof deck.